Carol Burnett wasn't always a showbiz legend and comedy icon, but even early on in her career, she seemed to be breaking new ground. When she appeared on Ed Sullivan's show in 1957 with her standup act about the different kinds of actresses you encounter at theater auditions, it was a glimpse of the future of comedy. Burnett's schtick was more comic acting than comedy, and it stood out among the impressionists, acrobats and some guy named Elvis Presley (he was pretty good). Within ten years Burnett had her own variety show, which she graciously shared with comedy heavy-hitters Harvey Korman, Tim Conway and her protege, Vicki Lawrence. 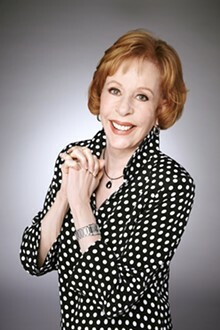 Burnett famously opened each show by taking questions from the audience, which she'll do again at Carol Burnett: An Evening of Laughter and Reflection. The night also includes video clips from her long-running show and reminiscences about the cast. The show starts at 7:30 p.m. Thursday, November 8, at the Stifel Theatre (1400 Market Street; www.stifeltheatre.com). Tickets are $65 to $175.